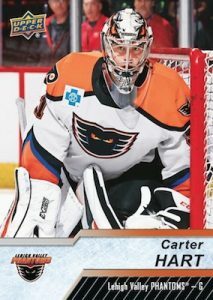 2018-19 Upper Deck AHL - Hockey Card Checklist	Overall rating:	4	out of 5 based on 1	reviews. 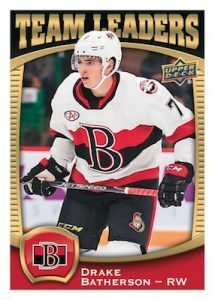 2018-19 Upper Deck AHL Hockey is the latest release of cards that feature the players of the NHL’s developmental league. The set looks at the players who are on the cusp of making the NHL, as well as those, who are just below NHL caliber. This years release sees a format change, offering 2 autographs and 16 packs per hobby box, down from the 3 autos and 20 packs that last years release had. The set is not an overly pricey one, and with names such as Carter Hart and Filip Zadina there is plenty of potential for some big hits.